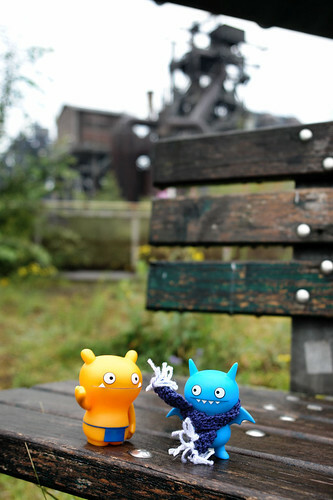 Uglyworld #26 - Wage & Icebat Take Timeout to Discuss The Landschaftspark, originally uploaded by www.bazpics.com. As everyone waited patiently for the sunlight to drop away and the artificial lights of the event to power up Wage and Icebat took some time out on a bench to discuss the Landschaftspark. I won't bore you with all the details but lets just say that the conversation started out a 4-way one with Wage, Ox, Wedgehead and Icebat all involved but became so heated that the other two slithered off into the distance. Wage was of the opinion that the Steam Train was the best thing found, and Icebat said that this was utterly proposterous (I think he's been reading the dictionary again) and that the highest tower "rocked".